I always get excited about pasta recipes because, well, I love pasta! Maybe it’s because there are so many variations that make pasta impossible to ever be boring. You could go comfort food style with cream sauces and lots of cheese, or healthy with vegetables and tomato sauce or flavored olive oils. Not only can you switch up the sauce, but you can also use different types of pasta noodles! Fettuccine is one of my favorites, and today I am sharing a salmon fettuccine recipe with you. When I think pasta, I think homestyle cooking. To me, homestyle cooking means using fresh, nutritious ingredients to prepare meals in my kitchen. My Mom and Grandma prepared home-cooked meals every night for our family when I was growing up. Cooking was a central part of family time. I owe my love for cooking to them!! 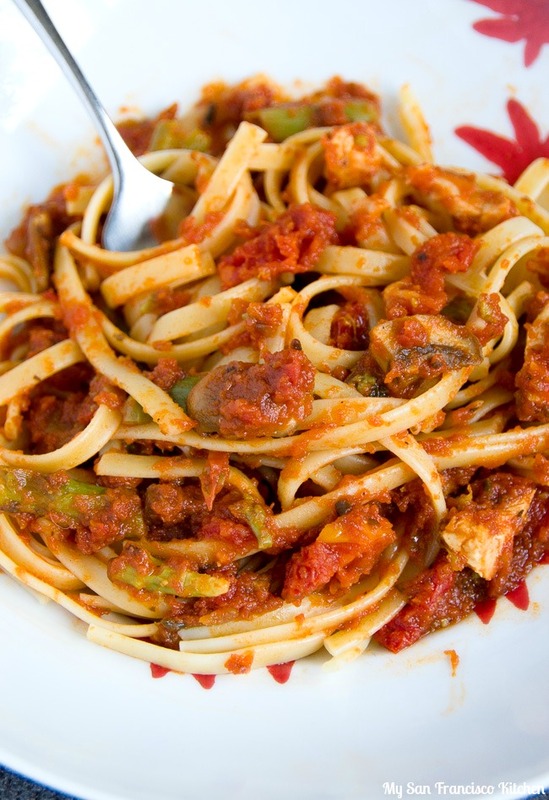 In this salmon fettuccine recipe, I used Ragu Homestyle Thick and Hearty Traditional Sauce for the sauce, and added mushrooms, asparagus, and sun-dried tomatoes to it. 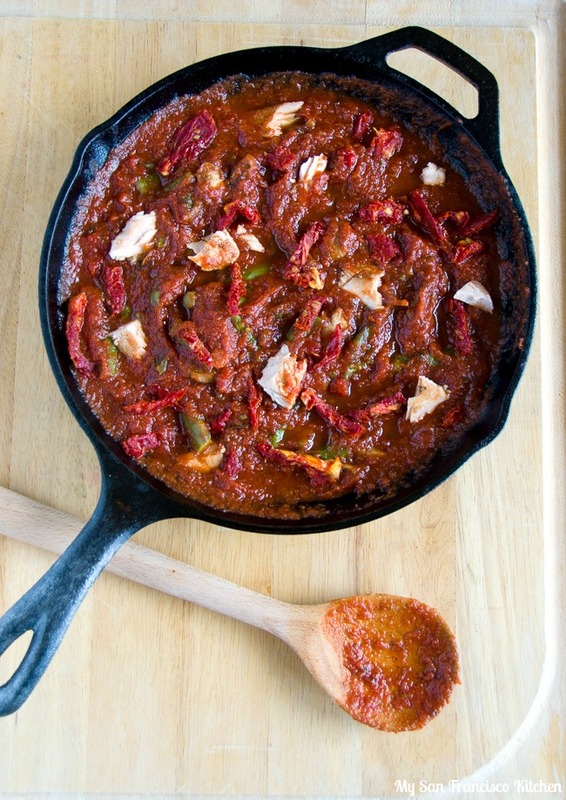 Feel free to add some crushed red peppers if you like it more on the spicy side. 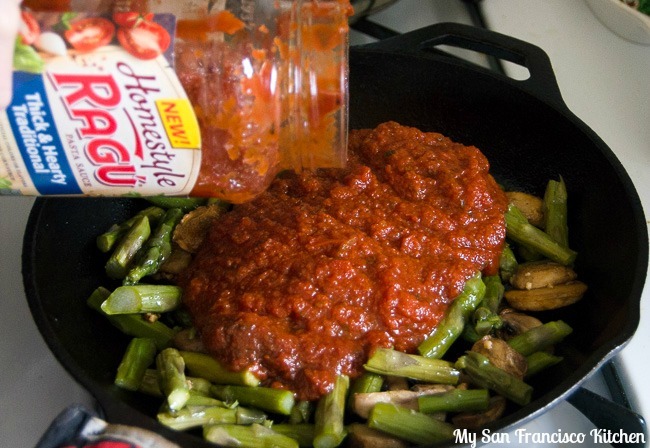 I love how thick this sauce it, it sticks really well to the pasta. I also like this pasta sauce brand because it doesn’t have artificial flavors, colors or high fructose corn syrup. Now that is what I call a good homestyle meal 🙂 Enjoy! 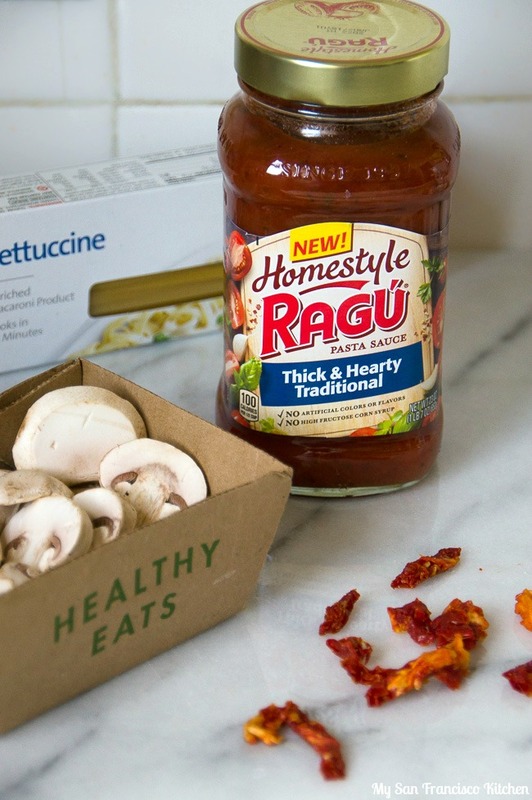 Visit Ragu’s website to learn more about the new line of Homestyle sauces and find recipe ideas the whole family will love. Heat 2 tbsp olive oil in a large skillet over medium heat. 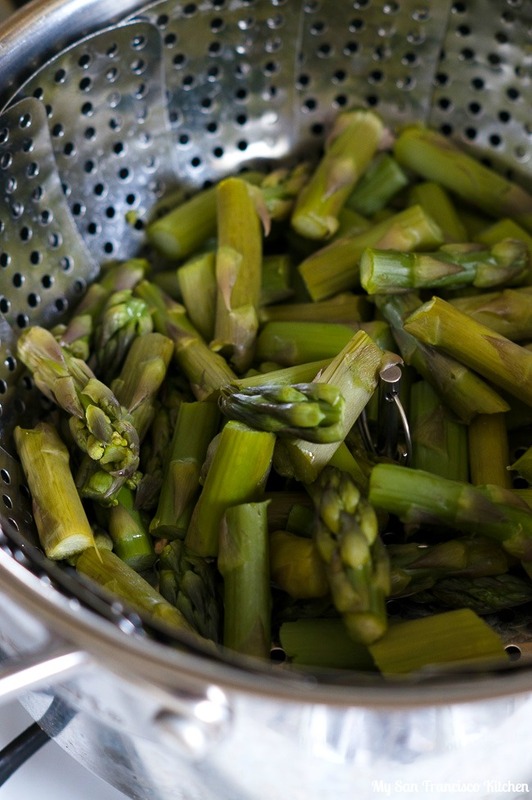 Add the mushrooms, garlic and asparagus to the skillet and cook for 10 minutes, until tender. Stir occasionally. In a separate skillet, heat 2 tbsp olive oil over medium heat and cook the salmon fillets until they easily flake with a fork. Add salt and pepper to taste, chop into bite-sized pieces and set aside. Bring a pot of water to boil and cook the fettuccine according to package directions. Drain and set aside. Toss the pasta together with the vegetables, sun-dried tomatoes, salmon and sauce. This entry was posted in Dinner, Italian, Seafood and tagged asparagus, fettuccine, mushrooms, pasta, salmon, sun-dried tomatoes. Yum! Asparagus and salmon sound like a great combo with pasta. Will have to put this on my menu. This looks like such a hearty (yet delicious) meal! My parents always made pasta when we were growing up and I love the addition of healthy veggies and protein 🙂 I’m partial to bowtie pasta, but fettuccine is one of my favorites, too!